Rainbow Rowell is a favorite author here in Calarco Library. Both Eleanor and Park and Fangirl have been wildly popular (so much so that I still haven’t gotten to read Fangirl; see Ms. Barrow’s review here). Attachments differs in that it’s not a YA novel, but fans will still find the humor, the great dialogue, and the deep characters they’ve come to expect. Unlike Malinda Lo’s previous book, Ash ( a retelling of Cinderella, and another popular read here at Calarco Library), Adaptation is a science-fiction thriller (though both share the ever-present love triangle – with a twist). “Across North America, flocks of birds hurl themselves into airplanes, causing at least a dozen to crash. Thousands of people die. Fearing terrorism, the United States government grounds all flights, and millions of travelers are stranded. You can find both books on the new book display, but not for long! -Signing off, Kit Gette (who really wants to read Fangirl). This entry was posted in Reader Advisory and tagged adaptation, attachments, malinda lo, rainbow rowell on January 21, 2014 by Mr. Gette. In post-9/11 America the threat of terrorism is omnipresent, a storm cloud thrusting a shadow on even the brightest days. Security is tighter than ever before in airports, public events, and wherever a significant public figure is concerned. Undoubtedly, the most protected individual in the country is the President. His security detail is, in fact, one of the best in the world. With a theoretically gripping scenario in which a bomb blows up across the street from the White House, David Baldacci examines the potential repercussions of such a serious breach of that world-renowned security. As Oliver Stone, a former secret agent/sniper who once went by the name John Carr, seeks answers to the many mysteries behind this incident and the many cover-up assassinations that follow, Baldacci scrutinizes the bureaucracy and factionalism within the U.S. government. Time and time again, Stone is rendered unable to prevent more deaths simply because certain leaders are unwilling to risk their political standings by sharing information with a washed-up assassin who has a somewhat disreputable history. Along the way, alliances with foreign nations – Great Britain especially – are called into question as well, since the attack is originally believed to target the Prime Minister, who is on a visit from the U.K.
As Stone and his partner from Britain’s MI-6, Mary Chapman, inch towards discovering the perpetrators, the danger increases. More and more people fall victim to the stealthy force working against the government. However, we are not left in much suspense. After a short time we realize a pattern wherein every time Chapman and Stone appear to discover an answer, they are soon proved wrong and someone else dies. For a mystery novel, the suspense factor is most definitely lacking. In addition, Baldacci tries to take on too many storylines at once in Corner. A plethora of suspects are scrutinized and a multitude of theories emerge, to the point where names and ideas blur together. Even the main characters require further description, which might be found in the previous works in this series. However, we wouldn’t know there are preceding volumes by looking at this book. Nowhere on the cover or in the description is the Camel Club series mentioned, but as it turns out Hell’s Corner is its fifth installment. Oliver Stone himself is underdeveloped; somehow he draws conclusions from thin air. When everyone else is baffled, he magically knows the answer. The only explanation we receive into the working of his mind happens when he asserts that, “I think of the highly unlikely, then push it to the practically impossible, and often find I arrive at the truth.” Thus, only a bare minimum of information is revealed. While such a premise is good in theory – who doesn’t love a hero who will always save the day? – Baldacci’s lack of investigation into the way Stone’s mind works makes the character unrealistic. If one is hoping for a riveting tale of suspense involving espionage, top government secrets, and detective work, look elsewhere. (I would recommend Transfer of Power by Vince Flynn.) With every chapter in Hell’s Corner, I struggled to remain interested even though I cherish books involving all of those elements. Baldacci reveals very little of such intriguing topics. In the end, he only exposes the fact that his status as a serial writer is taking its toll. Handfuls of grammar mistakes point to a writer under too much pressure to produce anything, as opposed to something valuable. With over 27 novels translated into 45 languages in 80-plus countries around the world, Baldacci can’t be expected to write earth-shattering works every time. Here, he appears to write simply for the sake of adding to his impressive statistics, not to add to his rave reviews. This entry was posted in Book Reviews, Student Contribution and tagged Book review, Student Review on January 16, 2014 by Jenny Nicolelli. You probably think that you know yourself pretty well. Sure, you may sometimes find that your close friends or family members seem to know you freakishly well, but in the end of the day, you are the expert on you. 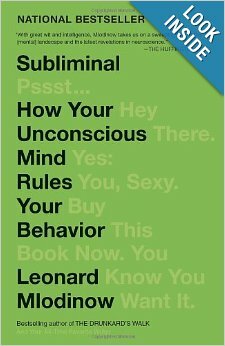 In Subliminal, Dr. Leonard Mlodinow sets out on a mission to convince you otherwise, and be warned, he is incredibly convincing. In the wake of breakthroughs made in the field of neuroscience during last two centuries, our previously accepted, and instinctually accepted perceptions of how our minds work have been completely dismissed. Recent findings using BMRI technology have revealed the enormous role that our unconscious plays in dictating our behavior, and this has lead psychologists and scientists to a pretty disconcerting conclusion: We have much less control than we think. After reading just the first few pages of the book, any reader will immediately feel the effect that the vast knowledge, and the incredible enthusiasm of the author has on the text. Mlodinow incorporates elements from his various past works including everything from his collaboration with Stephen Hawking on The Grand Design to his work on the children’s book, The Kids of Einstein Elementary. Mlodinow’s personal life plays a surprisingly large role in the book as Mlodinow applies principles concerning how the unconscious works to his relationship with his mother. Mlodinow’s mother is a holocaust survivor, and Mlodinow makes the case that her past experiences have left huge impressions on her unconscious of which she is unaware. For example Mlodinow presents us with the true story of how his mother called his roommate and accused him of murder when she was unable to reach her then 24 year old son one day. To the casual observer, his mother was exhibiting the traits of a complete nut-job, but Mlodinow defends her actions as being perfectly normal considering the effects that her past experiences have had on her unconscious. Mlodinow’s mother had been affected in a way that most of us cannot sympathize with. As Mlodinow explains, her reality had been turned upside-down in an instant, her entire family; her mother, her father, and her sister, were all killed overnight, and thus her unconscious openly accepts the possibility of immediate tragedy as a likely reality. When Mlodinow confronts her with this however, she denies that a subliminal force has altered her unconscious, and she even asserts that the two things have anything to do with each other and she firmly believes that her actions were attributed only to mundane sources. Mlodinow includes many examples of the subliminal at work like this one, and they serve well to demonstrate otherwise abstract concepts in a scene that makes such concepts both engrossing and easy to visualize. In short, this book is a sweeping review of key psychological research exemplified by an interesting array of supporting evidence regarding perception, decision-making, and the influence that others have on our behavior. Mlodinow reinforces the strength of his assertion that the unconscious affects everything by including both field studies, and everyday examples which vary so enormously, and at first seem so unrelated that by the time you reach the end of the book, you will feel that he has shown how the unconscious affects quite literally everything. The evidence he presents against the power that your conscious mind has in your everyday decision making will likely anger everyone from wine connoisseurs to the run of the mill walmart shopper. Mlodinow writes a book that is of formal, yet still easy to read style. The book’s transitions are very useful and efficient in making Subliminal read smoothly and fast-paced as if it were a novel. Each section ends with both a summary of the ideas discussed, as well as an ending paragraph or two that introduce the next topic and how it relates to the grand scheme of things. While one might think this writing formula would result in basic, tasteless writing, the summary-preview-review flows naturally and never seems forced. Mlodinow’s attention to flow enhances the readability and, ultimately, the usefulness of his book. Although the idea that you’re affected more by subliminal forces which affect your unconscious than you are by rational motives at first seems ominous, Mlodinow surprisingly ends by saying that the unconscious is not something to be feared, but rather something to be acknowledged and embraced. Mlodinow speaks to the effectiveness of the unconscious’ ability simplify life, citing thousands of years of evolution which have favored the unconscious as proof of its usefulness. He says that the unconscious has massive potential for good if it is conditioned and practiced like a muscle.“The unconscious is at its best when it helps us create a positive and fond sense of self, a feeling of power and control in a world full of powers far greater than the merely human.” Mlodinow’s final, optimistic conclusion leaves readers feeling both knowledgeable and enlightened upon finishing his book. If you are at all interested in psychology, neuroscience, or even economics, Subliminal is incredibly informative, and definitely for you. And even if you currently have no interest in the aforementioned fields, this book is such an interesting, enjoyable read that it might just inspire you to delve deeper into the world of psychology. The Iraqi war has been responsible for over 4000 US Military deaths since 2003, not to mention countless permanent injuries, both physical and psychological. In his first novel, The Yellow Birds, Kevin Powers draws from his experiences in the U.S. Army to create a vivid and insightful story about two young American men trying their best to survive in the Iraq War. The protagonist and narrator of the book is Private John Bartle, a 21-year old born and raised in rural Virginia. Bartle opens the story on a rooftop in Iraq, describing the environment and lifestyle challenges as an American soldier during the war; soldiers frequently find themselves under heavy fire as they fight to control the city of Al Tafar. From chapter to chapter, the author transitions to different locations and time periods seamlessly. Early on, the reader learns that back in 2003, Bartle foolishly had made a promise to the mother of his friend, Daniel Murphy, right before he and “Murph” were deployed. He promised Daniel’s mother that he would keep Daniel safe and bring him home, even though the wartime cliché of promising to come back alive, let alone bring another man back alive—is not a truly tenable reality. Soon after, the reader learns that Bartle is not able to live up to his promise. However, Bartle mentions Murph’s death without elaboration, and the reader is left with more questions than answers until later in the book. Bartle ultimately describes his friend’s death, the heartbreaking decision that he and his Sergeant were forced to make, and the events that followed. Throughout the book, Powers repeats a process of describing Bartle’s life during and after the war, going into great detail of how he felt and what was going through his mind. This nonlinear narrative style is similar to the nature of war, as it is chaotic and doesn’t follow a straight path; it is an experience defined by long periods of each soldier’s reflection, punctuated by brief, intense spurts of in-the-moment violent action, and later, episodes of Post-Traumatic Stress Disorder. But Powers writes his narrator’s expression most eloquently once he is home—beyond the fog of war. An example of his vivid description is shown in the following passage, describing his life back in Richmond after the war: “I looked over the railing down onto the old stone piers of earlier iterations of the bridge where earlier iterations of aimless walkers must have seen some kind of sight like this…and maybe seeing a small wavy outline of themselves reflected down below, with all that space around, thinking there was just so much damn space to be in that it hurt.” The rhetoric of this passage is due, in part, to Bartle’s own utter “aimless[ness].” He is reaching out, symbolically, to other “wavy outline[s]” of men; he is trying to escape his hurt, his feeling of loneliness, by displacing hurt into others. Overall, The Yellow Birds is an extremely well written and thoughtful account of the impact of war through the eyes of young men who were wholly unprepared for the work, experiences, decisions, and pain they would face. Their experiences are accessible to young people everywhere, most of whom have a wealth of other choices but who may not appreciate their good fortune. Because the Iraqi conflict may be invisible to many people in the United States, and too often it is someone else’s relative coming home in a pine box, the writer’s plain and graphic language serves to remind us of the physical and psychological devastation of war, even when that war is waged far from our shores. Have you ever wished to be someone different? Or wondered what it would be like to be another person? Immediately after describing his situation, A wakes up one morning in the body of a boy named Justin. A uses what he calls “accessing” in order to find out his name, normal activities, class schedule, and route to school. All of the other emotions are left up to A to decide as he runs the body for the day. When Justin gets to school, his girlfriend begins talking to him. A knows that this girl is Justin’s girlfriend, but he can tell by her body language that Justin does not treat her well. Up until now, A has never allowed his thoughts to influence the body’s life, but the girl, Rhiannon, strikes A so vividly that he cannot help himself. He meets Rhiannon later in the day at lunchtime and they leave school to go to the beach. Both A and Rhiannon have an amazing day as they sit by the water and talk for hours. To the reader, this feels like a first date for A and Rhiannon, but A is faced with the reality that tomorrow he will be a completely different person. And A falls in love. As the story goes on, A has to face the fact that he has no true identity in a way that he has never had to before. A begins messing up the lives of the people he inhabits as he goes back to find Rhiannon, though she has no idea that Justin was not really Justin that day on the beach. Suspicion begins to emerge when A does not get home in time for midnight one night and leaves the body he was in on the side of a road. But does love conquer all of these difficulties? Every Day is an inspiring novel in which our perception of reality, ironically, becomes clearer. Can you love someone whose appearance changes everyday? A different gender, a different eye color, a different height, a different family, a different school, sometimes a different town, and different talents, everyday those descriptions change. Can you imagine someone who jumps from body to body never having long-term friends, a long-term family, or a long-term home? What if you fell in love with someone’s soul? How would you handle it? David Levithan takes the reader on a journey through the difficulty of love and the exceptional experience of being in love. In Everyday by David Levithan the character A, who to others seems to be a soul but to me a human, jumps from body to body. For sixteen years, A’s soul enters another body for a day. He accesses his or her memories to live his or her normal routine life. Plays his or her sport for a day, goes to his or her school for a day, and loves his or her family for one day. One day, A spends 24 hours in this 16 year olds body, Jason. Jason is a typical cranky teenager. He doesn’t speak much to his parents; he does decent in school, and to A doesn’t seem to care about anything. From accessing Jason’s mind, he realizes he has a girlfriend named Rhiannon. He learns that Jason is a jerk. He rarely pays any attention to Rhiannon’s insightful thoughts and her impeccable details. When A comes in contact with Rhiannon he realizes her perfection. He acts like a charming boyfriend rather than an emotionless one. A, also known as Justin for the day, takes Rhiannon to the beach for a romantic date. For the first time in A’s life, he feels something for Rhiannon, strong feelings like love. For the next few days, A disrupts whosever body he is in. He finds multiple excuses to spy on Rhiannon at her school. I know it sounds creepy but I think it also sounds cute. One courageous day, A, in the body of a teenage girl finds Rhiannon and tells her everything, about his condition, how he feels about her, how he wants to see where their relationship goes. Rhiannon strangely believes him and together they build a relationship. How can their relationship work when A is in a different body every single day? Nonetheless A runs in many obstacles through out the book but one in particular causes him to question his identity as a being. All authors strive to add a certain sense of realism to their writing that will enthrall the reader. It’s popular to write violent finales that raise the stakes because you’re never sure if the characters are going to make it to the next page. Suzanne Collins and J.K. Rowling have established what a good, modern fantasy has to be: a group of kids trapped in a violent world they’re merely trying to survive. Half a century ago, Ray Bradbury established his own fantasy. Bradbury merely introduced strange events into the average lives of two kids, Jim Nightshade and Will Halloway. Will and Jim live in a picturesque town based on Ray Bradbury’s hometown, Waukegan. They spend their days firmly in the joys of childhood, but time runs differently for everyone in town. Jim is described as being aware and mature in his observations to the point that he has truly lived more than people his age. In contrast, Will is childishly self-involved. Every adult mourns a loss of youth. Suddenly though, bizarre things begin to intrude, especially with the arrival of a circus train. Bradbury has written every aspect into the theme of a fear of aging, and this theme perfectly ties everything, fantastic and realistic, together. The character motives connect as bits of their life are shown in this context; a scene of Holloway up at three am, or other characters pondering their lives in the dark of the night. The strongest aspect is the language, though. This book reads poetically and vividly: “There was a thing in Dad’s voice, up, down, easy as a hand winging soft in the air like a white bird describing flight patterns, made the ear want to follow and the mind’s eye to see.” This book remains one of the most quotable things I’ve ever read because of how succinctly Bradbury captures everyday life as if he were writing a Rockwell painting. The conflict addresses whether a way to relive those years existed and what could happen if it got into the wrong hands. The book flips between cynical adult life with Will’s father, Jim’s mother, even their school teacher, all haunted by very real tragedies: alienation from a child because of aging, the deaths of her children, a fear of wasted youth. Shuffled in are the starkly contrasting adventures of kids, youngsters chosen as the subject of fantasy for their youthful, anything-can-happen nature: where the discover wonders and magic all the time. This changing focus is clever, but every audience this book has at some point will get lost: children won’t be interested in depressed adults, and adults will be caught off guard by how hokey some of the plot can be, like the teacher’s panic in a mirror maze, screaming in fear at seeing her younger self upset. The ending of this book makes it a perfect feel good story. Everything starts out so bizarre, but after whipping into a full-fledged finale, all loose ends are tied off and the ending is wholesome in a way that completes the picture and puts a blanket of calm, self-acceptance over the characters. After such a long journey through a series of strange and disturbing events, the story ends in a way that’s so right, and so natural.